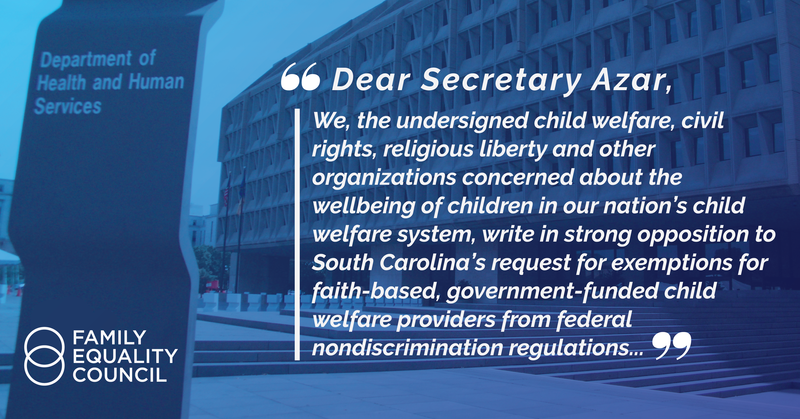 76 Every Child Deserves a Family Campaign members and allies have sent a letter to HHS’ Secretary Alex Azar with a clear message: Discrimination harms children, and granting South Carolina foster care agencies a license to discriminate violates child welfare law, policy, and professional standards. The state of South Carolina has requested a waiver from HHS’ nondiscrimination policies so that Miracle Hill, one of South Carolina’s largest taxpayer funded foster care agencies, can continue to turn away Jewish, LGBTQ, and other applicants to be foster parents and mentors who are not regular churchgoers in specific Protestant denominations. After receiving a complaint from an experienced Jewish foster mom who was turned away by Miracle Hill from being a mentor to foster youth due to her religion, the state’s Department of Children and Family Services had initially informed the agency it must comply with federal nondiscrimination policy or lose its contract. The governor then intervened and requested a waiver from HHS so that Miracle Hill could continue to discriminate. The letter makes it clear that a license to discriminate violates federal law requiring each state to ensure safety, permanency and wellbeing of children in care; federal nondiscrimination law and policy and children’s constitutional rights; and HHS’ legal obligation to ensure states comply with professional child welfare standards. Family Equality Council is a founding member of and co-chairs the Every Child Deserves a Family Campaign with the Child Welfare League of America, FosterClub, Lambda Legal, PFLAG National, and Voice for Adoption. The Campaign is comprised over 400 members who are child welfare advocates, faith organizations, civil rights organizations, foster alumni, and foster parents. Campaign members advocate for ending anti-LGBTQ and other discrimination in foster care and adoption, and promote safe and supportive care for LGBTQ and other overrepresented and marginalized youth in the child welfare system.